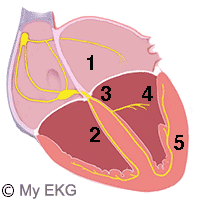 1.5% of patients may have a Bifascicular Block on the Electrocardiogram. This alteration is a combination of intraventricular conduction disturbances, which can carry a risk of progression to Complete Atrioventricular Block, especially in patients with syncopal symptoms 1. 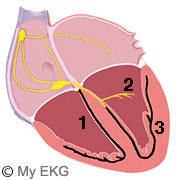 The ventricular conduction system can be classified as a three fascicles system. Consisting of the Right Bundle Branch, and the Anterior and Posterior fascicles of the Left Bundle Branch. A Bifascicular Block is the combination of a blockade of two of these branches. Right Bundle Branch Block + Left Anterior Fascicular Block. Right bundle branch block + Left Posterior Fascicular Block. Complete Left Bundle Branch Block: Equivalent to the blockade of both Fascicles. So, the Bifascicular Block has on the Electrocardiogram the characteristics of Right Bundle Branch Block combined with the corresponding Left Fascicular Block. The most common of Bifascicular Blocks. The Right Bundle Branch and the Left Anterior Fascicle are blocked, so the depolarization of the ventricles is performed from the Posterior Fascicle of the Left Branch. 1. Blocked Right Bundle Branch. 2. Blocked Left Anterior Fascicle. 3. Normal Left Posterior Fascicle. Wide QRS, longer than 120 ms. rSR’ morphology (broad R’ wave) in lead V1, qRS morphology (broad S wave) in lead V6. Abnormal repolarization. Marked Left Axis Deviation (-45º or more). qR Morphology lateral leads, rS Morphology in inferior leads 2. The right bundle branch and the left posterior fascicle are blocked, so the depolarization of the ventricles is performed from the anterior fascicle of the left branch. 2. Normal Left Anterior Fascicle. 3. Blocked Left Posterior Fascicle. Marked right axis deviation (120º or more). rS morphology lateral leads, qr morphology in inferior leads 2. In patients with Bifascicular Block in the electrocardiogram and episodes of syncope, there is the possibility that symptoms are secondary to an unknown advance Atrioventricular Block. A more complex cardiology study should be performed in these patients, even, in some cases, it is advisable to perform an Electrophysiological Study to estimate the Hiss-Ventricular interval (HV). In patients with Bifascicular Block in the EKG without symptoms, the risk of advance Atrioventricular Block is low, but is recommended clinical and electrocardiographic monitoring. Bifascicular Blocks not require treatment except if the patient had syncope or an advance AV block is detected. 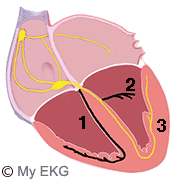 Permanent pacemaker implantation is indicated for complete AV block, or type II second-degree AV block. Also Permanent pacemaker implantation is reasonable for syncope when other likely causes have been excluded 3.